Heat 2 teaspoons of the sesame oil in large non-stick skillet set over medium-high heat. Add the chicken and cook until browned 3-4 minutes each side. Transfer chicken to plate, set aside. Add 4/5 of the scallions and 1 tablespoon of the ginger to the skillet, cook, stirring constantly until fragrant. Add the chicken broth and 2 tablespoons of the soy sauce, bring to boil. Reduce heat and simmer covered for 4 minutes. Add the chicken and return to simmer, cook covered about 12 minutes. Remove the skillet from heat, set aside for about 10 minutes then transfer the chicken to plate and set aside. Discard the pan liquid. For the sauce, combine 1 teaspoon of sesame oil, rest of scallion, 2 teaspoons ginger, 1 tablespoon soy sauce, red wine vinegar, cilantro and honey in small bowl. Note: based on recipe from Weight Watchers All-Time Favorites Cookbook. 707 members have added this recipe to their cookbook. This was so good , my whole family loved it. Thank you for sharing it. This was full of flavor & so moist. I didn't have anything but chicken tenders & I just cut cooking time down a few min. I always make 3 days of food ahead all in 1 day & then we heat it up; cause we are always on the go! We loved this recipe. A little prep work and then it was so easy and delicious. Will definitely make this again. This was great. The only reason I am giving a 4 instead of a five is because you should use low sodium soy sauce and low sodium chicken broth. I used both and the recipe was absolutely delicious. I also changed the directions a bit so it was easier to cook with less steps. I cooked the chicken, removed it from the pan. Sauteed the ginger and scallions for about 3 minutes then added the remaining liquids. I let it boil then added the chicken back to the pan and let simmer 12 minutes and turned off the heat and rest 10 additional minutes. Thanks for the recipe, I needed a new way to cook chicken. I WOULD CHANGE THE WAY IT IS MADE. INSTEAD OF ADDING CHICKEN BROTH I WOULD LEAVE THE CHICKEN IN THE PAN AND ADD EVERYTHING EXCEPT THE CHICKEN BROTH AND AT THE LAST COUPLE MINUTES I WOULD TAKE THE SIDE SAUCE POUR IT OVER THE CHICKEN AND REDUCE IT IN THE PAN WITH THE CHICKEN. IT WOULD BE MUCH MUCH BETTER! So delicious! I ate it for dinner and then chopped up on salad for my lunches during the week. I love this entree! It is very flavorful and low cal. 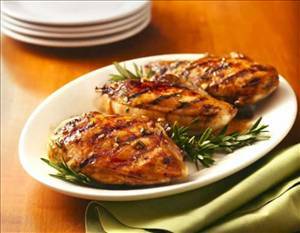 There are 206 calories in 1 serving of Soy-Ginger Chicken Breast. Calorie break-down: 22% fat, 19% carbs, 60% protein.